Whether you are looking to add a tree to your backyard, or a complete backyard remodeling with lush tropical plants and trees, JD Professional Landscaping Design has the right solution for you, at an affordable price. 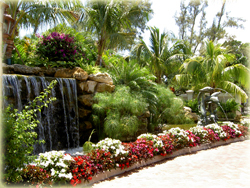 For the past 15 years our award winning landscape design team has provided South Florida homeowners with creative and innovative landscape designs. From acre lots to zero lots, our team will work with you to create a backyard that is a true reflection of your lifestyle and your personality. Our exclusive computer assisted design software allows us to create, using an actual picture of your home, a virtual rendering of what your completed landscape design will look like; including plants, rocks, pavers, and more. You will be able to see exactly what your landscape will look like even before we break ground.